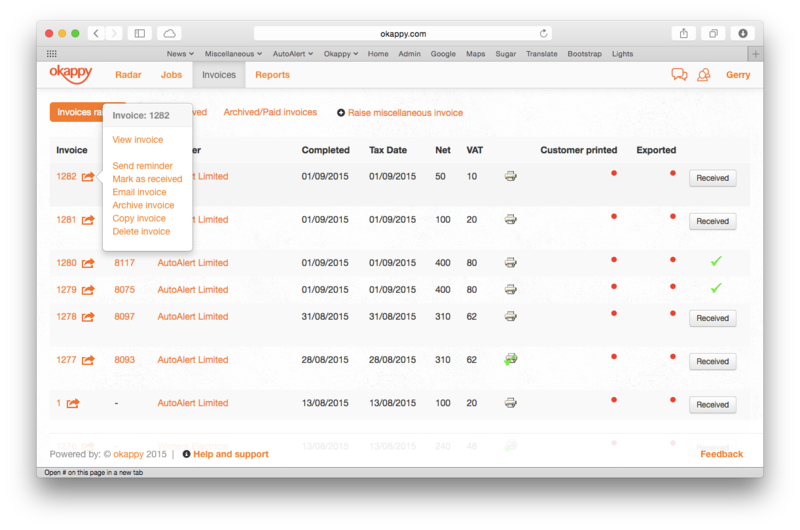 With Okappy, you can view all the invoices you have raised on one screen. Click the invoices button from your job screen or click the invoices option on your tab bar, if enabled. Note: To enable the invoices option in your tab bar, click on your name, click settings and then ensure the invoices option is ticked. Here's the Invoices Screen that shows all the invoices that you have raised. If the invoice has been raised from a job, you can click on the job number to view the job details. You can also see when the job was completed and the tax date of when the invoice was raised plus the net amount of the invoice and the VAT. The next column shows whether you have printed the invoice. You can see whether your customer has viewed and printed the invoice (this requires your customer to have authorised an account with Okappy and logged in. See connecting to your customer for more information about connecting to your customers and subcontractors). The exported column shows whether you have exported the invoice to Sage or Xero. The final column shows whether you have received payment for the invoice. Clicking the receive button updates the invoices to show that payment has been received. The button changes to a green tick ( ).